PORTLAND, Ore. – February 13, 2017 – Daimler Trucks North America (DTNA) announced today that it has been awarded LEED Platinum Certification for its new Corporate Headquarters building in Portland, Oregon. The LEED (Leadership in Energy and Environmental Design) rating system, developed by the U.S. Green Building Council (USGBC), is the foremost program for buildings, homes, and communities that are designed, constructed, maintained and operated for improved environmental and human health performance. DTNA achieved LEED certification for implementing practical and measurable strategies and solutions aimed at achieving high performance in sustainable site development, water savings, energy efficiency, materials selection and indoor environmental quality. LEED is the foremost program for the design, construction and operation of green buildings. 95% of the demolition and construction waste was recycled from the project site. 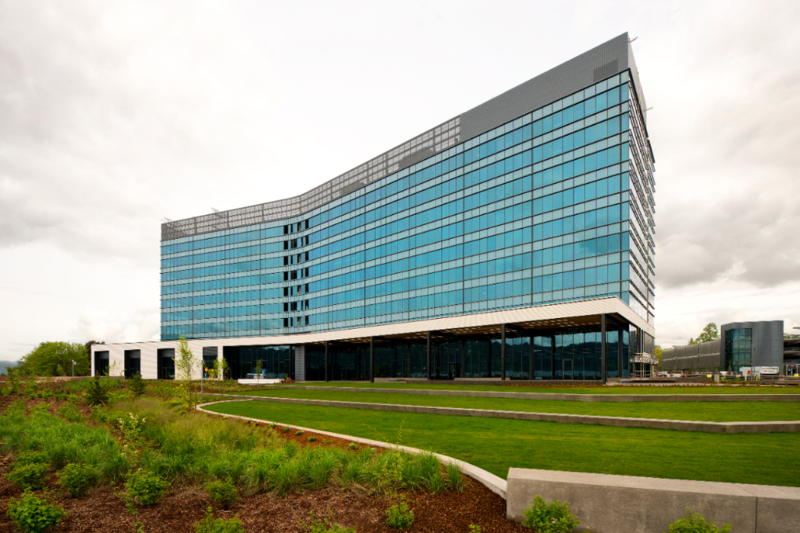 The dramatically reduced energy consumption of the building was achieved through a variety of features, including LED lighting, an intelligently controlled radiant HVAC system, and onsite renewable energy. A living green wall is installed in the lobby to bring the outdoors inside with the natural air cleaning benefits of vegetation absorbing CO2 and a green roof for storm water management. A new greenway path running along the Willamette for use by employees and the public. 100% outdoor air provided to each space with higher levels of filtration improves air quality. A new employee transportation program that provides subsidized access to public transportation, increased electric car charging stations and access to a fleet of electric onsite Smart cars for employee use.